The documentation for matplotlib is generated from ReStructured Text using the Sphinx documentation generation tool. Sphinx-1.0 or later is required. you can also pass a latex flag to make.py to build a pdf, or pass no arguments to build everything. The output produced by Sphinx can be configured by editing the conf.py file located in the doc/. The actual ReStructured Text files are kept in doc/users, doc/devel, doc/api and doc/faq. The main entry point is doc/index.rst, which pulls in the index.rst file for the users guide, developers guide, api reference, and faqs. The documentation suite is built as a single document in order to make the most effective use of cross referencing, we want to make navigating the Matplotlib documentation as easy as possible. In addition to the “narrative” documentation described above, matplotlib also defines its API reference documentation in docstrings. For the most part, these are standard Python docstrings, but matplotlib also includes some features to better support documenting getters and setters. single point of configuration so changes to the properties don’t require multiple docstring edits. as automated as possible so that as properties change, the docs are updated automagically. Note there is a problem for Artist __init__ methods, eg. 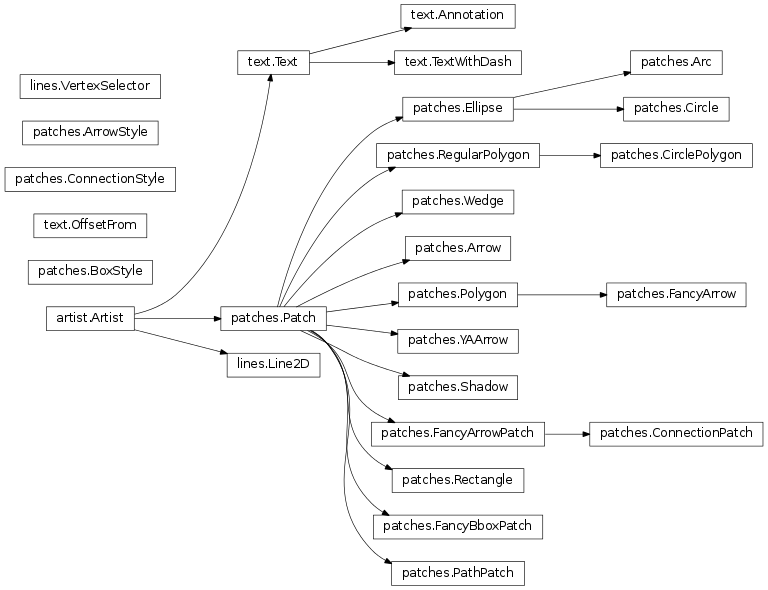 matplotlib.patches.Patch.__init__(), which supports Patch kwargs, since the artist inspector cannot work until the class is fully defined and we can’t modify the Patch.__init__.__doc__ docstring outside the class definition. There are some some manual hacks in this case, violating the “single entry point” requirement above – see the artist.kwdocd['Patch'] setting in matplotlib.patches. Please familiarize yourself with the Sphinx directives for inline markup. Matplotlib’s documentation makes heavy use of cross-referencing and other semantic markup. For example, when referring to external files, use the :file: directive. Please do not describe `argument` like this. Please do not describe ``argument`` like this. Sphinx does not support tables with column- or row-spanning cells for latex output. Such tables can not be used when documenting matplotlib. This feature is obsolete, use something else. Deprecated since version 0.98: This feature is obsolete, use something else. The transforms have been completely revamped. New in version 0.98: The transforms have been completely revamped. Please keep the Glossary in mind when writing documentation. You can create a references to a term in the glossary with the :term: role. The autodoc extension will handle index entries for the API, but additional entries in the index need to be explicitly added. Please limit the text width of docstrings to 70 characters. Keyword arguments should be described using a definition list. matplotlib makes extensive use of keyword arguments as pass-through arguments, there are a many cases where a table is used in place of a definition list for autogenerated sections of docstrings. Figures can be automatically generated from scripts and included in the docs. It is not necessary to explicitly save the figure in the script, this will be done automatically at build time to ensure that the code that is included runs and produces the advertised figure. The :scale: directive rescales the image to some percentage of the original size, though we don’t recommend using this in most cases since it is probably better to choose the correct figure size and dpi in mpl and let it handle the scaling. A directive for including a matplotlib plot in a Sphinx document. By default, in HTML output, plot will include a .png file with a link to a high-res .png and .pdf. In LaTeX output, it will include a .pdf. If this source file is in a non-UTF8 or non-ASCII encoding, the encoding must be specified using the :encoding: option. The encoding will not be inferred using the -*- coding -*- metacomment. If provided, the code will be run in the context of all previous plot directives for which the :context: option was specified. This only applies to inline code plot directives, not those run from files. If specified, the code block will be run, but no figures will be inserted. This is usually useful with the :context: option. Additionally, this directive supports all of the options of the image directive, except for target (since plot will add its own target). These include alt, height, width, scale, align and class. Code that should be executed before each plot. that determine the file format and the DPI. For entries whose DPI was omitted, sensible defaults are chosen. Whether to show links to the files in HTML. A dictionary containing any non-standard rcParams that should be applied before each plot. By default, rcParams are applied when context option is not used in a plot directive. This configuration option overrides this behaviour and applies rcParams before each plot. By default, the working directory will be changed to the directory of the example, so the code can get at its data files, if any. Also its path will be added to sys.path so it can import any helper modules sitting beside it. This configuration option can be used to specify a central directory (also added to sys.path) where data files and helper modules for all code are located. Provide a customized template for preparing resturctured text. Contact John Hunter for the login password to upload youtube videos of google docs to the mplgithub account. One exception to this is when referring to the examples dir. Relative paths are extremely confusing in the sphinx plot extensions, so without getting into the dirty details, it is easier to simply include a symlink to the files at the top doc level directory. This way, API documents like matplotlib.pyplot.plot() can refer to the examples in a known location. In addition, since underscores are widely used by Sphinx itself, let’s prefer hyphens to separate words. Class inheritance diagrams can be generated with the inheritance-diagram directive. To use it, you provide the directive with a number of class or module names (separated by whitespace). If a module name is provided, all classes in that module will be used. All of the ancestors of these classes will be included in the inheritance diagram. A single option is available: parts controls how many of parts in the path to the class are shown. For example, if parts == 1, the class matplotlib.patches.Patch is shown as Patch. If parts == 2, it is shown as patches.Patch. If parts == 0, the full path is shown.